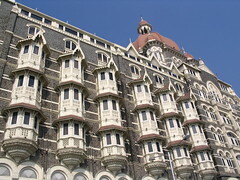 The Taj Hotel is just down the block from the Sea Palace hotel where I stayed in Mumbai in February 2007. The Sea Palace was far more modest than the glorious Taj. At the time, I was mildly jealous of the Taj guests. I bet they had more toilet paper and no cats hanging out of the ceiling. I thought that if I ever get a chance to go back to Bombay, I'd like to stay at the Taj.